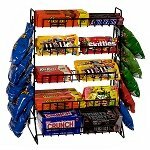 Make your shop feel like candy land with this White Candy Snack Rack. Built with six metal shelves that measure about 35 inches long is designed to hold lots of sweet treats for your patrons, whether they are young or young at heart. Our metal snack stand includes the header sign frame that has two three-inch stems that sit atop the floor fixture in a secure fashion. Not only that, but this retail display also includes the casters, so you can move it throughout your store with ease. Made to hold all those tasty and delicious boxed goodies as well as other snacks. You are sure to love this white retail fixture as you watch the candy fly off the shelves and the profits fly into your register. Order yours today! 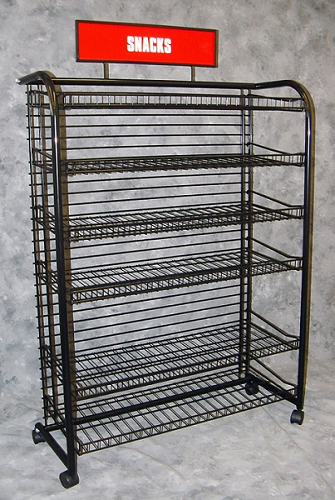 3 Shelf Rounded Top Beverage Racks - 10"